Despite being stung by a qularr drone during the invasion of Millennium City, Westside teenager Anthony Allan did not recieve superpowers like his comic book idols. Years later however he was doused in draysha fluid during a VIPER attack while visiting a friend Downtown. The interaction of the two chemicals in his system gave him the increased strength and agility of the qularr aliens. 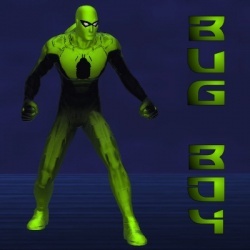 Deciding to put his new abilities to use, he joined the growing ranks of heroes protecting the city as Bug Boy. This page was last modified on 5 December 2014, at 06:15.